This document explains architecture concepts of Red Hat Satellite 6 and provides recommendations for your deployment planning. Red Hat supports many different scripting and other frameworks, including Puppet modules. Support for these frameworks is based on the article How does Red Hat support scripting frameworks? Supported combinations of major versions of Red Hat Enterprise Linux and hardware architectures for registering and managing hosts with Satellite 6.2. This includes the Satellite Tools Repositories. Supported combinations of major versions of Red Hat Enterprise Linux and hardware architectures for host provisioning with Satellite 6.2. Supported combinations of major versions of Red Hat Enterprise Linux and hardware architectures for configuration management with Satellite 6.2. 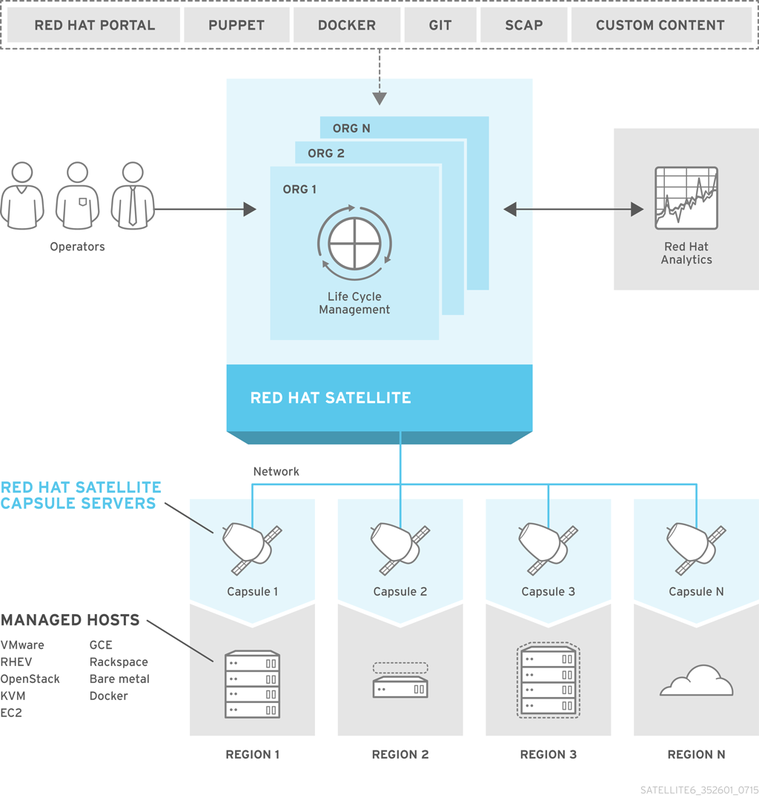 For details on Capsule requirements, installation process, scalability considerations and more, see the Red Hat Satellite Installation Guide. The Ports and Firewalls Requirements section of the Red Hat Satellite Installation Guide contains complete instructions for configuring the host-based firewall to open the ports required. A matrix table of ports is also available in the following Knowledgebase solution Red Hat Satellite 6.2 List of Network Ports. Organizations – the highest level logical groups for hosts. Organizations provide a strong separation of content and configuration. Each organization requires a separate subscription manifest, and can be thought of as a separate virtual instance of a Satellite Server. Avoid the use of organizations if a lower level host grouping is applicable. Locations – a grouping of hosts that should match the physical location. Locations can be used to map the network infrastructure to prevent incorrect host placement or configuration. For example, you cannot assign a subnet, domain, or compute resources directly to a Capsule Server, only to a location. Host groups – the main carriers of host definitions including assigned Puppet classes, Content View, or operating system. Find the complete list of host group parameters in the Configuring the Provisioning Environment Chapter in the Red Hat Satellite Host Configuration Guide. It is recommended to configure the majority of settings at the host group level instead of defining hosts directly. Configuring a new host then largely becomes a matter of adding it to the right host group. As host groups can be nested, you can create a structure that best fits your requirements (see Section 3.1, “Host Group Structures”). Host collections – a host registered to the Satellite Server for the purpose of subscription and content management is called content host. Content hosts can be organized into host collections, which enables performing bulk actions such as package management or errata installation. Locations and host groups can be nested, organizations and host collections are flat. The fact that host groups can be nested to inherit parameters from each other allows for designing host group hierarchies that fit particular workflows. A well planned host group structure can help to simplify the maintenance of host settings. This section outlines four approaches to organizing host groups. The advantage of a flat structure is limited complexity, as inheritance is avoided. In a deployment with few host types, this scenario is the best option. However, without inheritance there is a risk of high duplication of settings between host groups. In this hierarchy, the first host group level is reserved for parameters specific to a life cycle environment. The second level contains operating system related definitions, and the third level contains application specific settings. Such structure is useful in scenarios where responsibilities are divided among life cycle environments (for example, a dedicated owner for the Development, QA, and Production life cycle stages). This hierarchy is based on roles of hosts in a specific application. For example, it enables defining network settings for groups of back-end and front-end servers. The selected characteristics of hosts are segregated, which supports Puppet-focused management of complex configurations. However, the content views can only be assigned to host groups at the bottom level of this hierarchy. In this hierarchy, the distribution of locations is aligned with the host group structure. In a scenario where the location (Capsule Server) topology determines many other attributes, this approach is the best option. On the other hand, this structure complicates sharing parameters across locations, therefore in complex environments with a large number of applications, the number of host group changes required for each configuration change increases significantly. This section provides an overview of general topics to be considered when planning a Red Hat Satellite 6 deployment together with recommendations and references to more specific documentation. For an example implementation based on a sample customer scenario (specific to Satellite 6.1), see the article 10 Steps to Build an SOE: How Red Hat Satellite 6 Supports Setting up a Standard Operating Environment. The first step to a working Satellite infrastructure is installing an instance of Red Hat Satellite Server on a dedicated Red Hat Enterprise Linux 7 Server as described the Red Hat Satellite Installation Guide. Consider the installation prerequisites and considerations for large deployments outlined in the same guide. A subscription manifest is a set of encrypted files that contains your subscription information. Satellite Server uses this information to access the CDN and find what repositories are available for the associated subscription. For instructions on how to create and import a subscription manifest see Managing Subscriptions in the Red Hat Satellite Content Management Guide. If you need to manage systems but do not have access to the subscriptions, then make use of the Smart Management subscriptions which entitles you to manage systems without have the entitlement to subscribe to software repositories. What services will be provided by Capsule Servers? – After establishing the number of Capsules, decide what services will be enabled on each Capsule. Even though the whole stack of content and configuration management capabilities is available, some infrastructure services (DNS, DHCP, TFTP) can be outside of a Satellite administrator’s control. In such case, Capsules have to integrate with those external services (see Section 6.5, “Capsule with External Services”). Is my Satellite Server required to be disconnected from the Internet? – Disconnected Satellite is a common deployment scenario (see Section 6.4, “Disconnected Satellite”). If you require frequent updates of Red Hat content on a disconnected Satellite, plan an additional Satellite instance for inter-Satellite synchronization. What compute resources do I need for my hosts? – Apart from provisioning bare metal hosts, you can use various compute resources supported by Satellite 6. To learn about provisioning on different compute resources see the Red Hat Satellite Provisioning Guide. Repositories configured as yum repositories, that contain only RPM packages, can make use of the new download policy setting to save on synchronization time and storage space. This setting enables selecting from Immediate, On demand, and Background. The On demand setting saves space and time by only downloading packages when requested by clients. The Background setting saves time by completing the download after the initial synchronization. For detailed instructions on setting up content sources see the Importing Red Hat Content section of the Red Hat Satellite Content Management Guide. Satellite 6 provides features for precise management of the content life cycle. A life cycle environment represents a stage in the content life cycle, a Content View is a filtered set of content, and can be considered as a defined subset of content. By associating Content Views with life cycle environments, you make content available to hosts in a defined way (see Figure 1.2, “Content Life Cycle in Red Hat Satellite 6” for visualization of the process). For a detailed overview of the content management process see the Red Hat 6 Content Management Guide. The following section provides general scenarios for deploying content views as well as life cycle environments. Satellite 6 provides several features to help you automate the host provisioning, including provisioning templates, configuration management with Puppet, and host groups for standardized provisioning of host roles. For a description of the provisioning workflow see Understanding the Provisioning Workflow in the Red Hat Satellite 6 Provisioning Guide. The same guide contains instructions for provisioning on various compute resources. Find instructions on defining roles and assigning them to users in the Red Hat Satellite Server Administration Guide. The same guide contains information on configuring external authentication sources. Importing existing hosts – if you have existing hosts that have not been managed by Satellite 6 in the past, you can import those hosts to the Satellite Server. This procedure is usually a step in transitioning from Red Hat Satellite 5, see the Red Hat Satellite Transition Guide for detailed documentation. 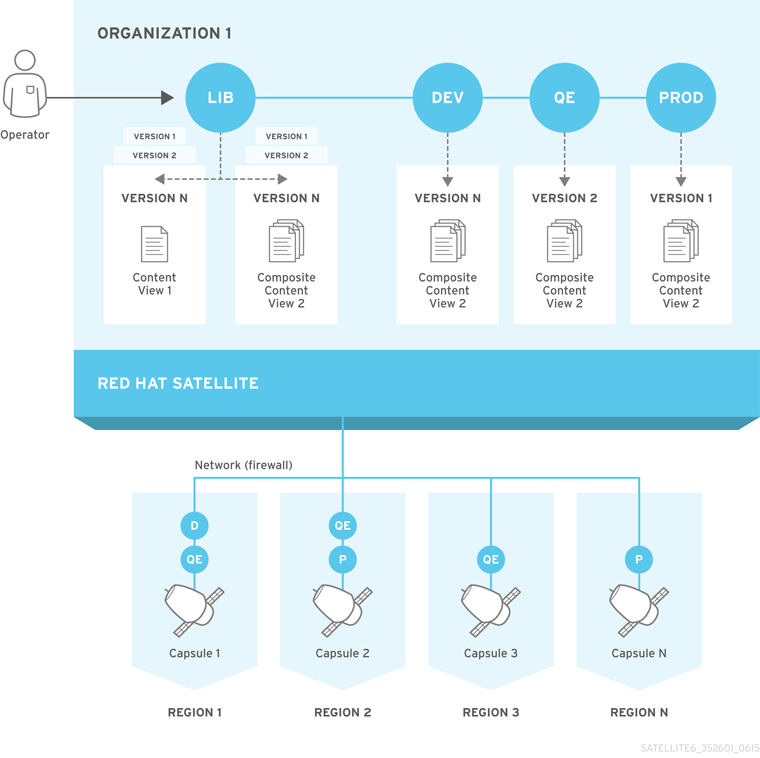 A high level overview of the transition process is available in Red Hat Knowledgebase article Transitioning from Red Hat Satellite 5 to Satellite 6. Discovering bare metal hosts – the Satellite 6 Discovery plug-in enables automatic bare-metal discovery of unknown hosts on the provisioning network. These new hosts register themselves to the Satellite Server and the Puppet agent on the client uploads system facts collected by Facter, such as serial ID, network interface, memory, and disk information. After registration you can initialize provisioning of those discovered hosts. For details, see Discovering Bare-metal Hosts on Satellite in the Red Hat Satellite Host Configuration Guide. Backup management – procedures for backup and disaster recovery of Satellite Server are available (see Backup and Disaster Recovery in the Red Hat Satellite Server Administration Guide). Using remote execution, you can also configure recurring backup tasks on managed hosts. For more information on remote execution see Running Jobs on Satellite Hosts in the Red Hat Satellite Host Configuration Guide. Security management – Satellite 6 supports security management in various ways, including update and errata management, OpenSCAP integration for system verification, update and security compliance reporting, and fine grained role based authentication. Find more information on errata management and OpenSCAP concepts in the Red Hat Satellite Host Configuration Guide. Scripting with Hammer and API – Satellite 6 provides a command line tool called Hammer that provides a CLI equivalent to the majority of web UI procedures. In addition, you can use the access to the Satellite API to write automation scripts in a selected programming language. For more information see the Red Hat Hammer CLI Guide and Red Hat API Guide. During the installation of Satellite, system accounts are created. They are used to manage files and process ownership of the components integrated into Satellite. Some of these accounts have fixed UIDs while others take the next available UID on the system instead. In order to control the UIDs assigned to the various accounts, it is possible to fix the UID by predefining those accounts. Because some of the accounts have hard-coded UIDs, it is not possible to do this with all accounts created during Satellite installation. The following table provides an overview of all the accounts created by Satellite during installation. Accounts marked with flex UID are allowed to be pre-defined with a custom UID before the installation of Satellite. Red Hat does not recommend changing any parameter or value of a given account other than the UID, because fields such as home or shell are requirements for Satellite to work correctly. This glossary documents various terms used in relation to Red Hat Satellite 6. A token for host registration and subscription attachment. Activation keys define subscriptions, products, content views, and other parameters to be associated with a newly created host. A configuration file that defines settings for an installation scenario. Answer files are defined in the YAML format and stored in the /etc/foreman-installer/scenarios.d/ directory. The result of an OpenSCAP audit. Summarizes the security compliance of hosts managed by Red Hat Satellite. Enables remote power management of bare-metal hosts. In Satellite 6, you can create a BMC interface to manage selected hosts. An ISO image used for PXE-less provisioning. This ISO enables the host to connect to the Satellite Server, boot the installation media, and install the operating system. There are several kinds of boot disks: host image, full host image, generic image, and subnet image. An additional server that can be used in a Red Hat Satellite 6 deployment to facilitate content federation and distribution (act as a Pulp node), and to run other localized services (Puppet Master, DHCP, DNS, TFTP, and more). Capsules are useful for Satellite deployment across various geographical locations. In upstream Foreman terminology, Capsule is referred to as Smart Proxy. A document that describes the desired system state for one specific host managed by Puppet. It lists all of the resources that need to be managed, as well as any dependencies between those resources. Catalogs are compiled by a Puppet Master from Puppet manifests and data from Puppet Agents. A service within Katello responsible for subscription management. Refers to a scheduled task executed on the Satellite Server that checks the specified hosts for compliance against SCAP content. Specifies default attributes for new virtual machines on a compute resource. A virtual or cloud infrastructure, which Red Hat Satellite 6 uses for deployment of hosts and systems. Examples include Red Hat Enterprise Virtualization, OpenStack, EC2, and VMWare. An isolated application sandbox that contains all runtime dependencies required by an application. Satellite 6 supports container provisioning on a dedicated compute resource. A static snapshot of the container’s configuration. Satellite 6 supports various methods of importing container images as well as distributing images to hosts through content views. A general term for everything Satellite distributes to hosts. Includes software packages (RPM files), Puppet Modules, Docker images, or OSTree snapshots. Content is synchronized into the Library and then promoted into life cycle environments using content views so that they can be consumed by hosts. The mechanism used to deliver Red Hat content to the Satellite Server. The part of a host that manages tasks related to content and subscriptions. A subset of Library content created by intelligent filtering. Once a content view is published, it can be promoted through the life cycle environment path, or modified using incremental upgrades. Content views are a refinement of the combination of channels and cloning from Red Hat Satellite 5. A bare-metal host detected on the provisioning network by the Discovery plug-in. Refers to the minimal operating system based on Red Hat Enterprise Linux that is PXE-booted on hosts to acquire initial hardware information and to communicate with the Satellite Server before starting the provisioning process. Enables automatic bare-metal discovery of unknown hosts on the provisioning network. 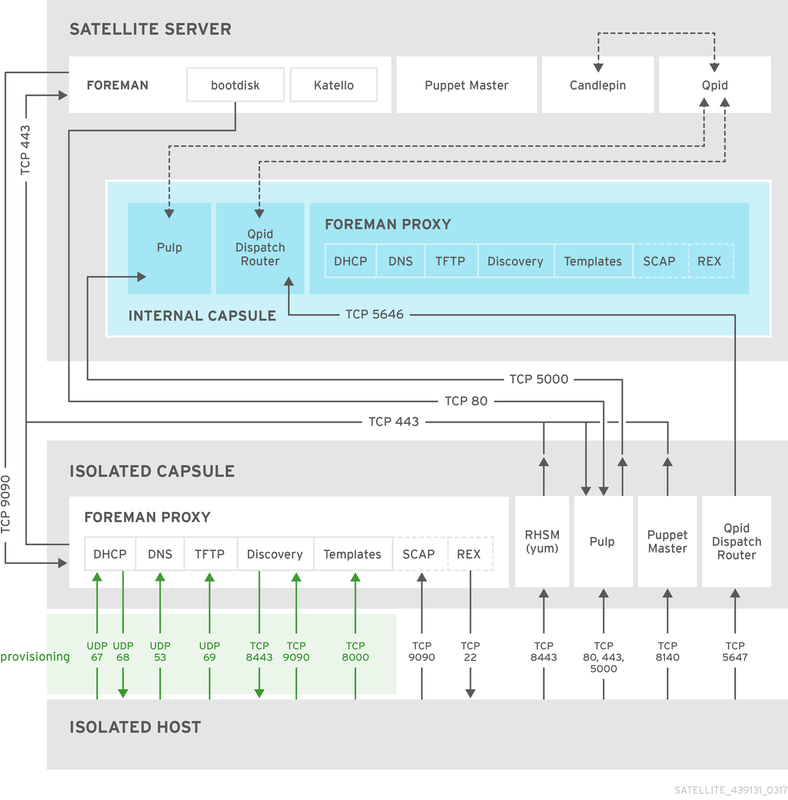 The plug-in consists of three components: services running on the Satellite Server and the Capsule Server, and the Discovery image running on host. A set of predefined provisioning rules which assigns a host group to discovered hosts and triggers provisioning automatically. A mark used to differentiate container images, typically by the version of the application stored in the image. In the Satellite 6 web UI, you can filter images by tag under Content > Docker Tags. Embedded Ruby (ERB) is a template syntax used in provisioning and job templates. Updated RPM packages containing security fixes, bug fixes, and enhancements. In relationship to a host, erratum is applicable if it updates a package installed on the host and installable if it is present in the host’s content view (which means it is accessible for installation on the host). A Puppet construct that provides additional data for a Puppet Master to use when configuring hosts. Red Hat Satellite 6 acts as an External Node Classifier to Puppet Masters in a Satellite deployment. A program that provides information (facts) about the system on which it is run; for example, Facter can report total memory, operating system version, architecture, and more. Puppet modules enable specific configurations based on host data gathered by Facter. Host parameters such as total memory, operating system version, or architecture. Facts are reported by Facter and used by Puppet. The Red Hat Satellite 6 component mainly responsible for provisioning and content life cycle management. 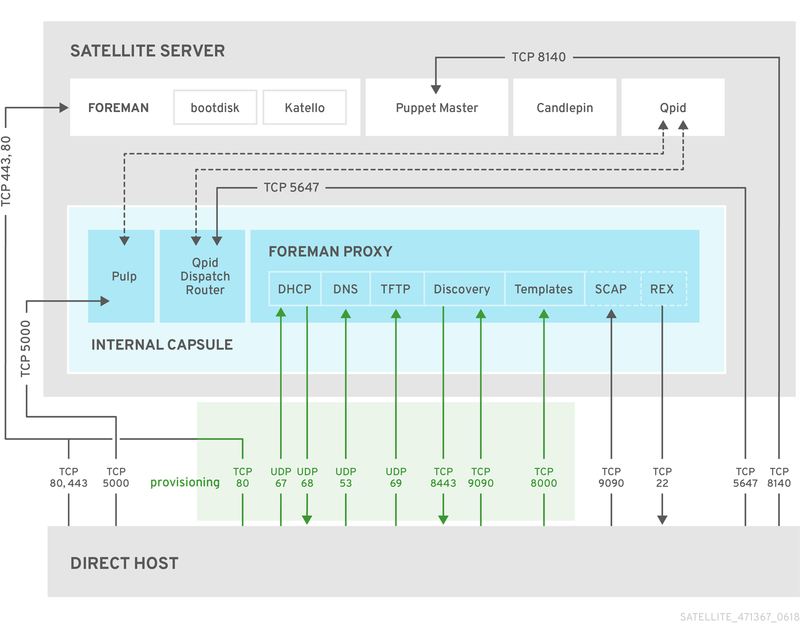 Foreman is the main upstream counterpart of Red Hat Satellite 6. An executable that is automatically triggered when an orchestration event occurs, such as when a host is created or when provisioning of a host has completed. A boot disk used for PXE-less provisioning of a specific host. The full host image contains an embedded Linux kernel and init RAM disk of the associated operating system installer. A boot disk for PXE-less provisioning that is not tied to a specific host. The generic image sends the host’s MAC address to the Satellite Server, which matches it against the host entry. A command line tool for managing Red Hat Satellite 6. You can execute Hammer commands from the command line or utilize them in scripts. Hammer also provides an interactive shell. Refers to any system, either physical or virtual, that Red Hat Satellite 6 manages. A user defined group of one or more Hosts used for bulk actions such as errata installation. Equivalent to a Satellite 5 System Group. A template for building a host. Host groups hold shared parameters, such as subnet or life cycle environment, that are inherited by host group members. Host groups can be nested to create a hierarchical structure. A boot disk used for PXE-less provisioning of a specific host. The host image only contains the boot files necessary to access the installation media on the Satellite Server. The act of creating a new (minor) content view version in a life cycle environment. Incremental upgrades provide a way to make in-place modification of an already published content view. Useful for rapid updates, for example when applying security errata. A command executed remotely on a host from the Satellite Server. Every job is defined in a job template. Similar to remote command in Satellite 5. Defines properties of a job. A Foreman plug-in responsible for subscription and repository management. The ability to change a yum repository’s default download policy of Immediate to On Demand or Background. The On Demand setting saves storage space and synchronization time by only downloading the packages when requested by a client, and the Background setting saves synchronization time by downloading packages after synchronizing the repository’s metadata. A collection of default settings that represent a physical place. A container for content from all synchronized repositories on the Satellite Server. The primary life cycle environment existing by default for each organization, the root of every life cycle environment path and the source of content for every content view. A container for content view versions consumed by the content hosts. A Life Cycle Environment represents a step in the life cycle environment path. Content moves through life cycle environments by publishing and promoting content views. A sequence of life cycle environments through which the content views are promoted. You can promote a content view through a typical promotion path; for example, from development to test to production. Channel cloning implements this concept in Red Hat Satellite 5. A mechanism for transferring subscriptions from Red Hat Customer Portal to Red Hat Satellite 6. This is similar in function to certificates used with Red Hat Satellite 5. A project implementing security compliance auditing according to the Security Content Automation Protocol (SCAP). OpenSCAP is integrated in Satellite 6 to provide compliance auditing for managed hosts. An isolated collection of systems, content, and other functionality within a Satellite 6 deployment. A tool for managing bootable, immutable, versioned file system trees. Satellite 6 supports mirroring OSTree snapshots as well as distributing them in content views. Defines the behavior of Red Hat Satellite components during provisioning. Depending on the parameter scope, we distinguish between global, domain, host group, and host parameters. Depending on the parameter complexity, we distinguish between simple parameters (key-value pair) and smart parameters (conditional arguments, validation, overrides). A parameter created by importing a class from Puppet Master. Defines an action related to a selected part of Satellite infrastructure (resource type). Each resource type is associated with a set of permissions, for example the Architecture resource type has the following permissions: view_architectures, create_architectures, edit_architectures, and destroy_architectures. You can group permissions into roles and associate them with users or user groups. A collection of content repositories. Products are either provided by Red Hat CDN or created by the Satellite administrator to group custom repositories. The act of moving a content view from one life cycle environment to another. Defines host provisioning settings. Provisioning templates can be associated with host groups, life cycle environments, or operating systems. In Satellite 6 they provide similar functionality to Kickstart Profiles and Cobbler Snippets in Red Hat Satellite 5. The act of making a content view version available in a life cycle environment and usable by hosts. A service within Katello responsible for repository and content management. A Capsule Server component that mirrors content. This is similar to the Red Hat Satellite 5 Proxy. The main difference is that content can be staged on the Pulp Node before it is used by a host. The configuration management component of Satellite 6. A service running on a host that applies configuration changes to that host. An isolated set of Puppet Agent nodes that can be associated with a specific set of Puppet Modules. Refers to Puppet scripts with file names using the .pp extension. A Capsule Server component that provides Puppet manifests to hosts for execution by the Puppet Agent. A self-contained bundle of code (Puppet manifests) and data (facts) that you can use to manage resources such as users, files, and services. A job executed automatically according to a schedule. In the Satellite 6 web UI, you can view those jobs under Monitor > Recurring logics. An archive of container images. Satellite 6 supports importing images from local and external registries. Satellite itself can act as an image registry for hosts. However, hosts cannot push changes back to the registry. A module providing access to selected Red Hat Customer Portal services from the Satellite web UI. Provides storage for a collection of content. Refers to a part of Satellite infrastructure, for example host, capsule, or architecture. Used in permission filtering. Specifies a collection of permissions that are applied to a set of resources, such as hosts. Roles can be assigned to users and user groups. Satellite provides a number of predefined roles. A file containing the configuration and security baseline against which hosts are checked. Used in compliance policies. A set of predefined settings for the Satellite CLI installer. Scenario defines the type of installation, for example to install the Capsule Server execute satellite-installer --scenario capsule. Every scenario has its own answer file to store the scenario settings. A Capsule Server component that can integrate with external services, such as DNS or DHCP. In upstream Foreman terminology, Smart Proxy is a synonym of Capsule. A configuration value used by classes in Puppet modules. A controlled version of the operating system on which applications are deployed. A type of generic image for PXE-less provisioning that communicates through the Capsule Server. An entitlement for receiving content and service from Red Hat. Refers to mirroring content from external resources into the Red Hat Satellite 6 Library. Provides scheduled execution of content synchronization. A background process executed on the Satellite or Capsule Server, such as repository synchronization or content view publishing. You can monitor the task status in the Satellite web UI under Monitor > Tasks. A means of tracking changes in specific parts of Satellite 6 infrastructure. Configure trends in Satellite web UI under Monitor > Trends. A collection of roles which can be assigned to a collection of users. This is similar to a Role in Red Hat Satellite 5. Anyone registered to use Red Hat Satellite. Authentication and authorization is possible through built-in logic, through external resources (LDAP, Identity Management, or Active Directory), or with Kerberos. An agent for retrieving IDs of virtual machines from the hypervisor. When used with Satellite 6, virt-who reports those IDs to the Satellite Server so that it can provide subscriptions for hosts provisioned on virtual machines.